This speaker was designed for small cinemas. Applications: High-end PA. This speaker is suitable for classical music. The original cabinets (picture) were designed without the projecting side panels to ensure absolute top performance. The Oberton D2544/16 tweeter is being used in conjunction with the RCF Horn H100. 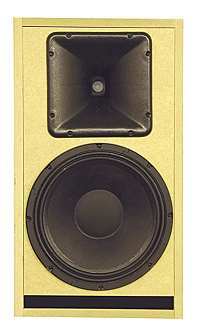 Bass is supplied by the Eminence Kappa 12, showing a beautifully flat frequency response. The following frequency response was measured with a calibrated Clio microphone, without any projecting edges. The cabinet was not damped (for PA speakers that's common). For hi-fi we recommend some napped foam for the rear wall and 1 pack of damping fleece. The crossover is exceptional: both drivers are in phase (the intersection of both lines is approx. 6 dB below the total frequency curve). Picture below: Below 30 degree angle (horizontal deviation) from the axis, the size of the drivers becomes noticeable. The 12.' bass driver that works up to 2,2 kHz, slops considerably according to the law of physics as does the tweeter at the highest frequencies. Important for excellent sound is the quick excursion of drivers shown in the following diagram as rapidly declining volume toward the front. This has been achieved quite comprehensively. The cabinet consists of 19 mm boards; it's easy to build since all panels are fitted in a right angle. The bass reflex port may be countersunk slightly. The crossover components should be mounted on a wooden board and then fitted in empty space. The terminal should be mounted on the rear panel of the cabinet. For hi-fi we recommend to fit 1/4 napped foam to the rear panel as well as 1 1/2 bags of damping fleece per speaker. Please bear in mind that the damping fleece material reduces the power handling to 300 Watts (heat dissipation!). The crossover consists of high quality components (foil capacitors, air core coils and one i-point core coil. Hint: upon request we also supply - instead of Speakon connector - a terminal with 2 gold plated brass binding posts at no additional charge.